In the modern workplace you expect more from yourself and more from your technology. The all-in-one RexRotary Aficio MP 4002 / MP 4002SP meets these evolving expectations. 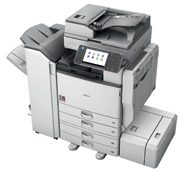 They streamline your workflows with outstanding black and white printing, copying, faxing and colour scanning (RexRotary MP4002SP). Then they give you the customised innovation you need to achieve your personal objectives and meet user requirements.